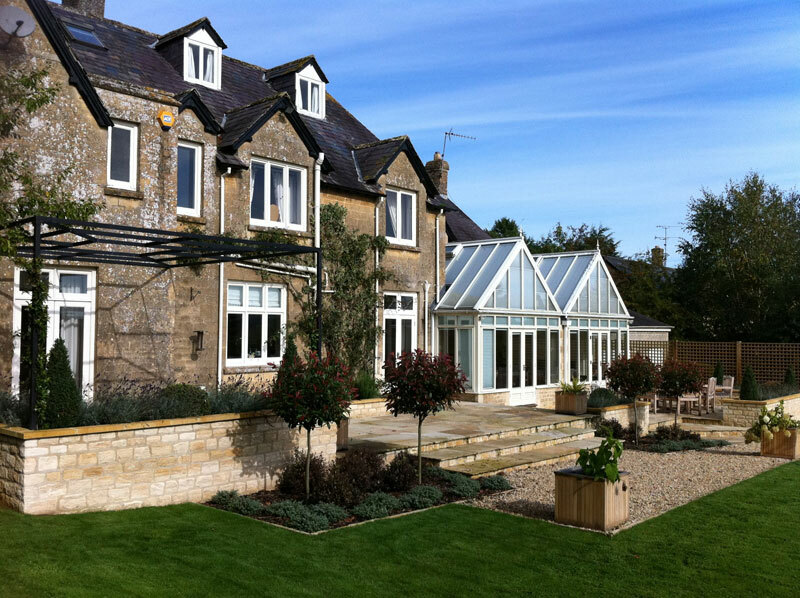 Brief – The design and build a terrace garden that is in proportion with this house and garden, and encourages the client to enjoy spending time in the garden, without increasing the overall maintenance required. 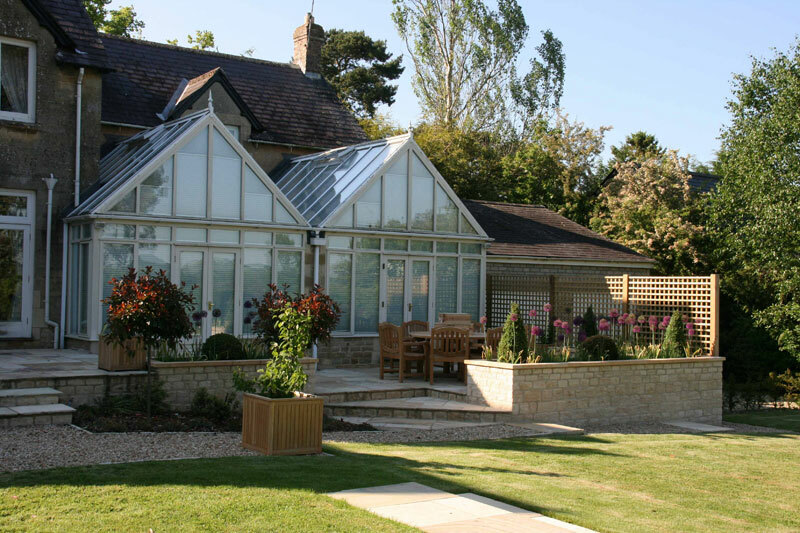 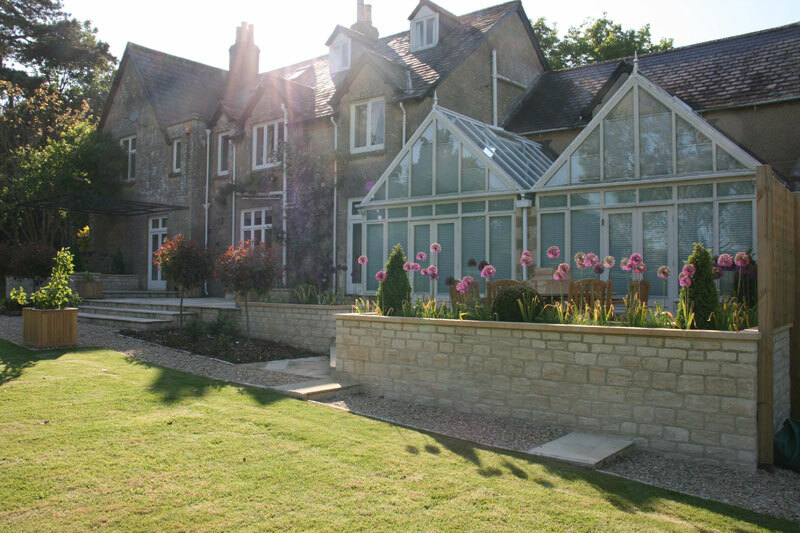 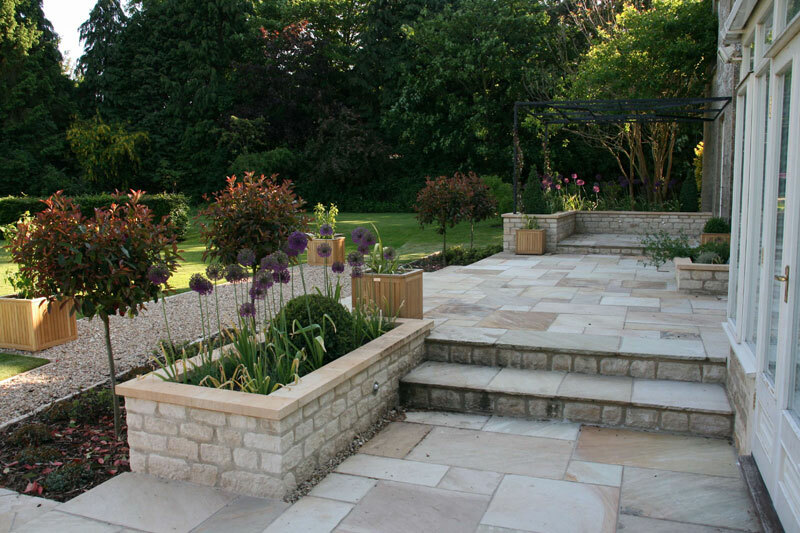 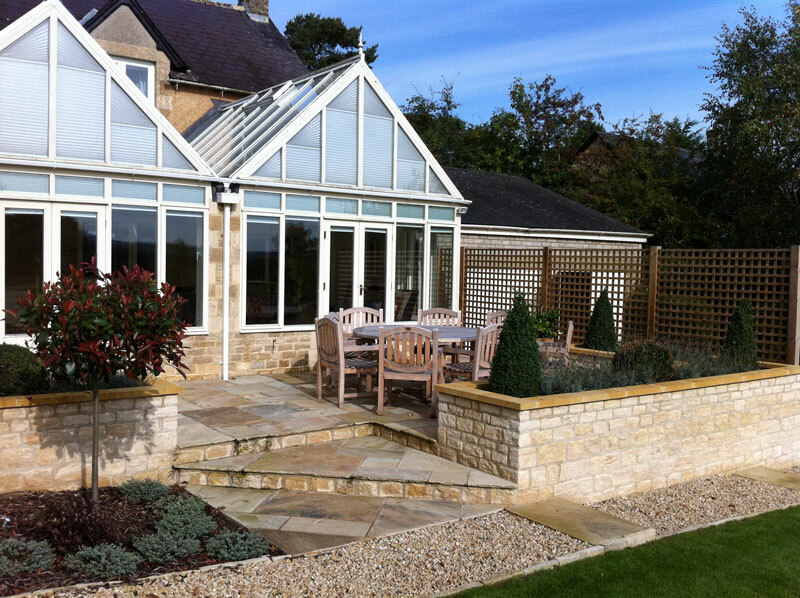 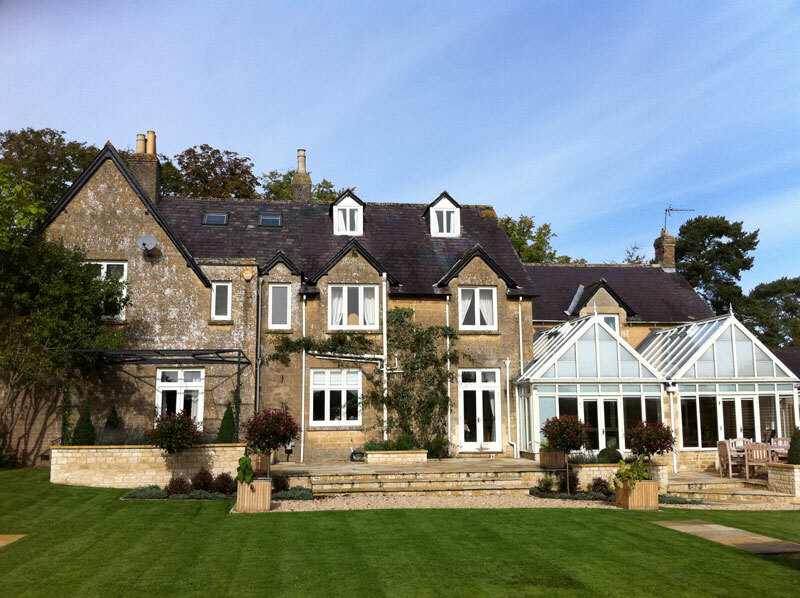 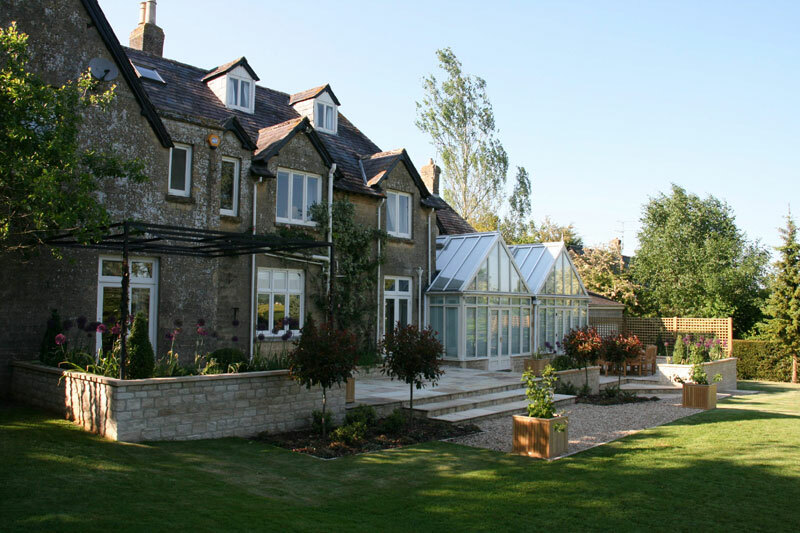 A large sandstone terrace was created on three levels, with Cotswold stone raised beds surrounding the seating areas of the terrace. 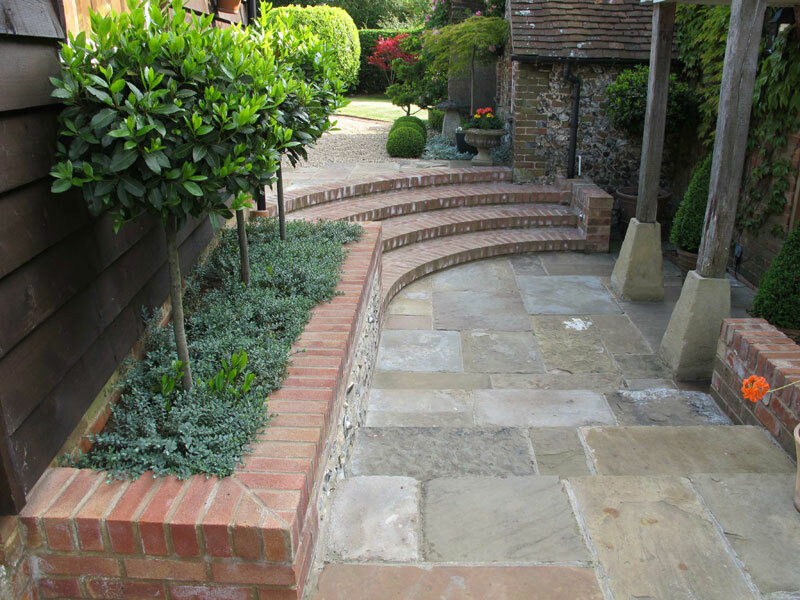 Broad steps sweep down to the lawn, and lead your eye to view to a sculpture through an avenue of Amelanchiers. 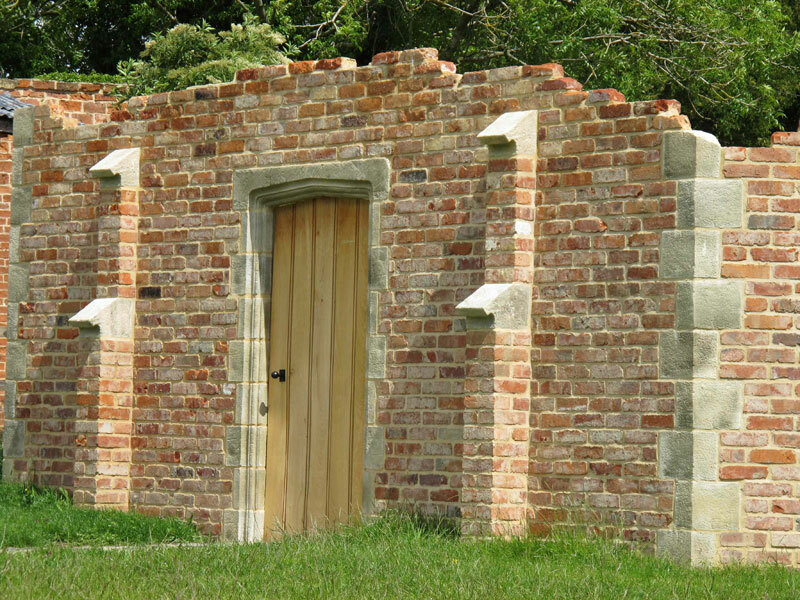 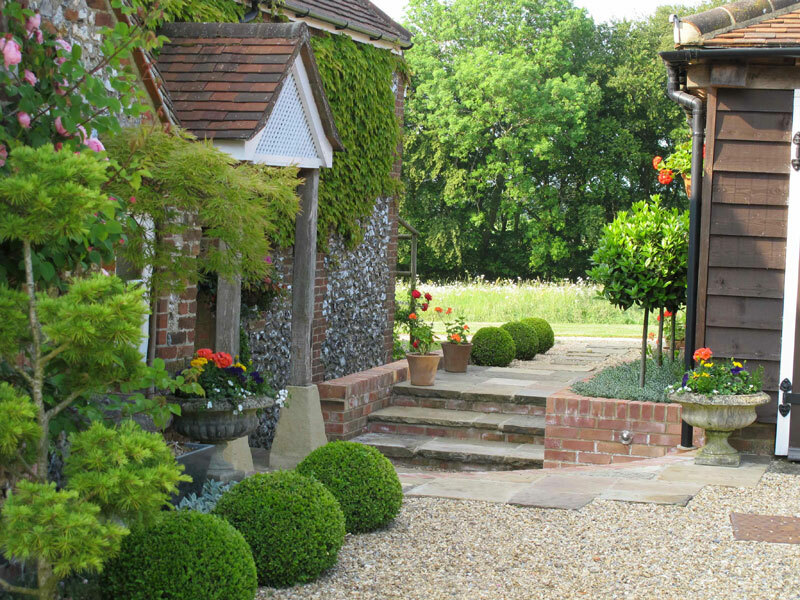 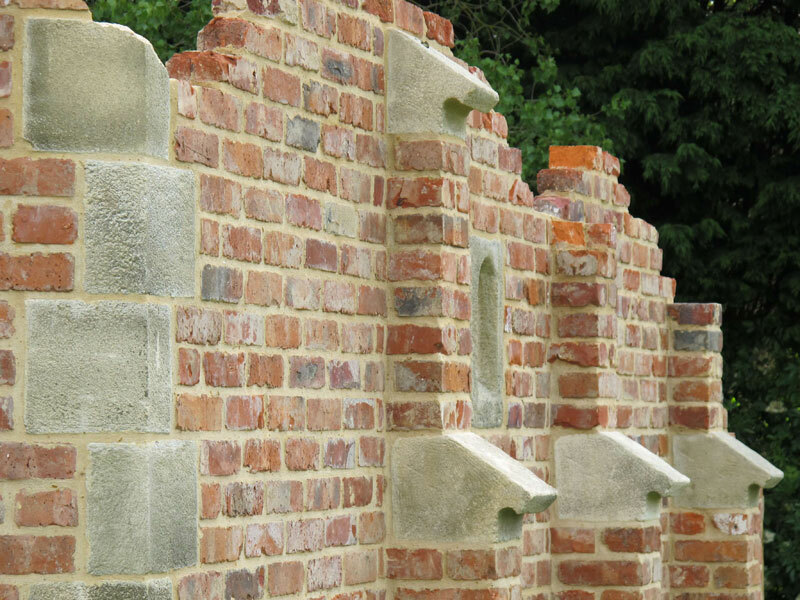 Brief – To design and create a new entrance to a beautiful brick and flint cottage in the Chilterns. 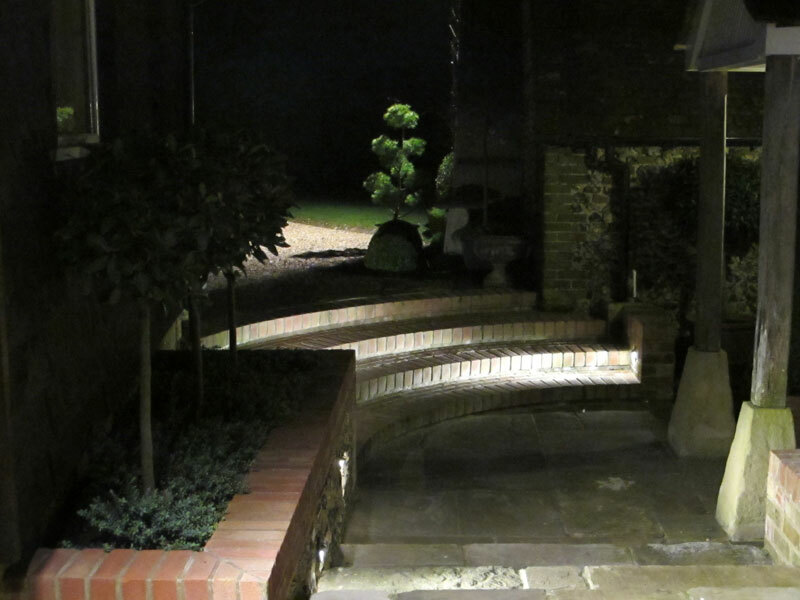 The client wanted an improved area that welcomed guests into the home, but still allowed easy access through to the garden and double garage. 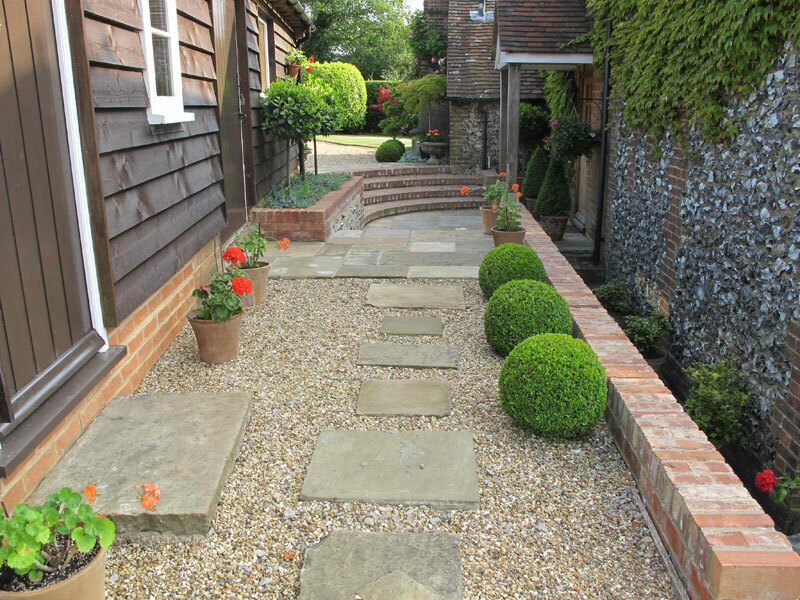 Using the local materials of brick and flint we created a new set of broad semi-circular steps that sweep down to the front door, with a raised border with standard Bay topiary. 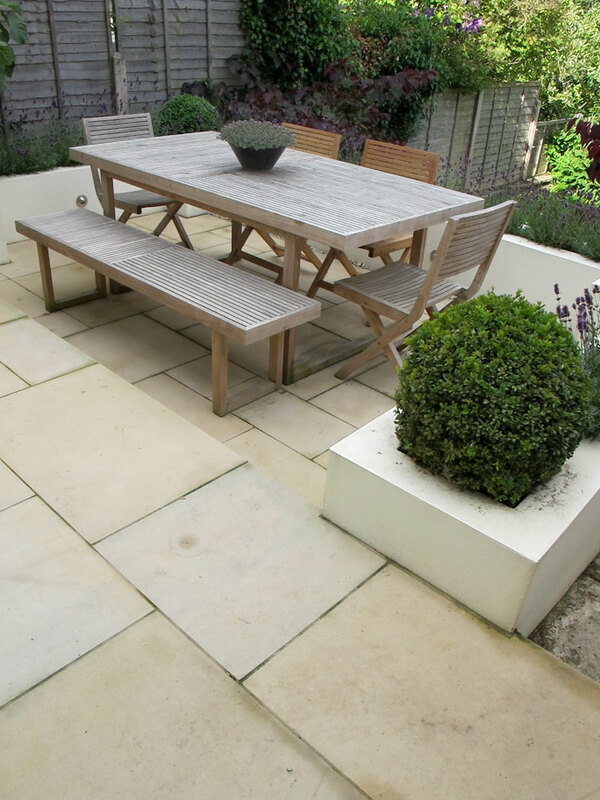 Reclaimed yorkstone provides a suitable paving that is in keeping with the age of the property. 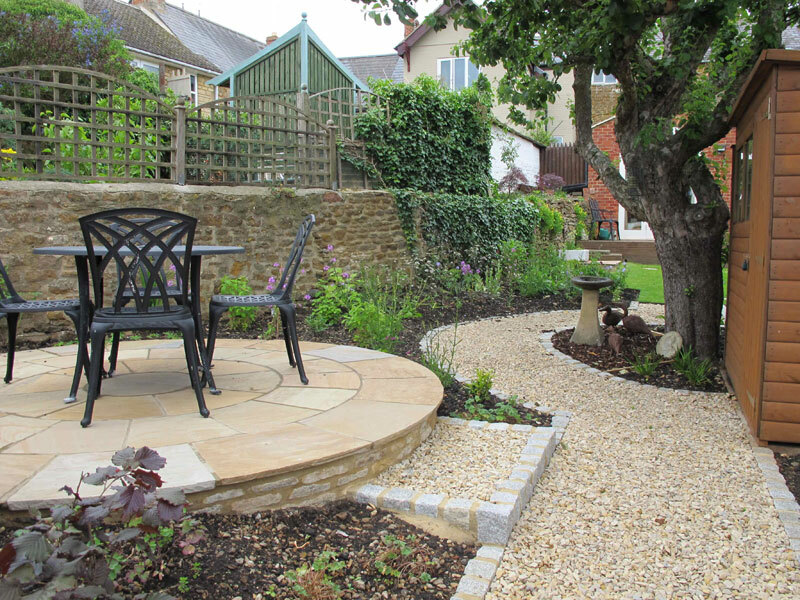 Brief – To transform a large overgrown town garden that is principally to the front of the property, into an outside space that complimented the house and provided privacy from the adjoining holiday let. 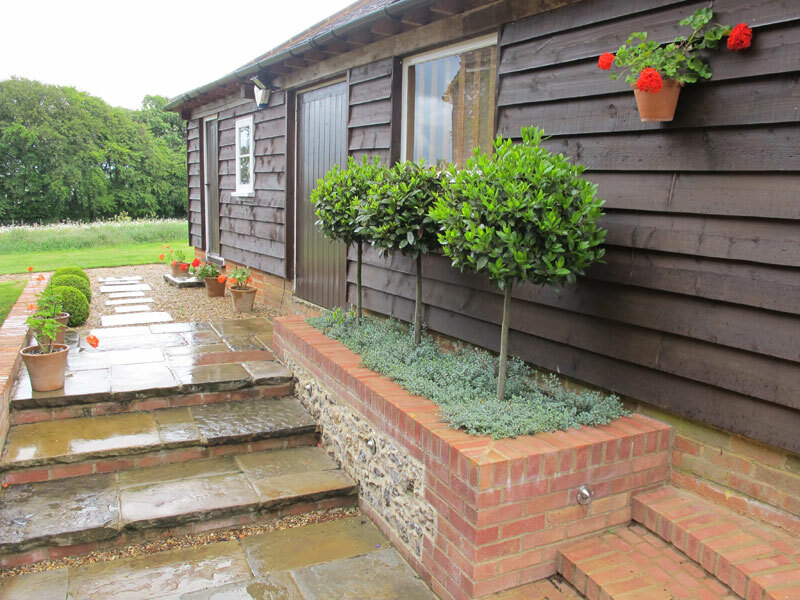 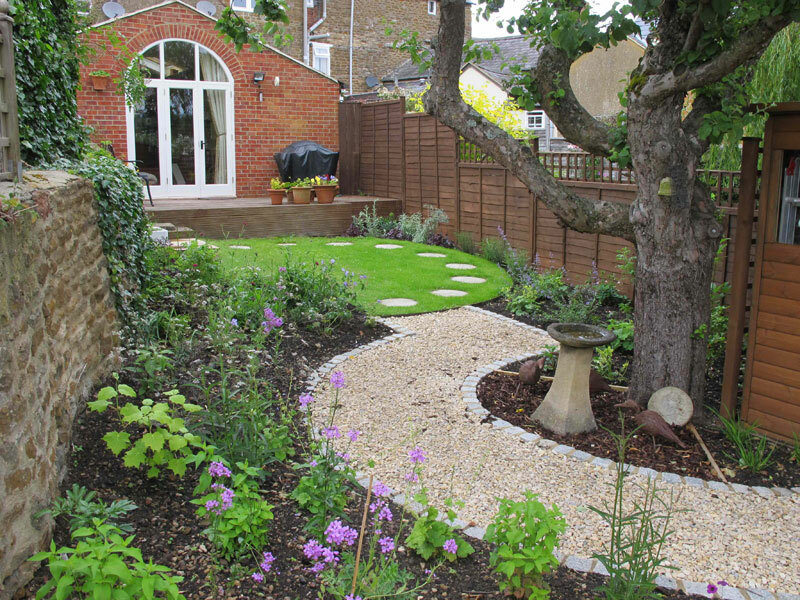 The garden included a new drive with parking area that was divided from the garden with a row of pleached Hornbeam. 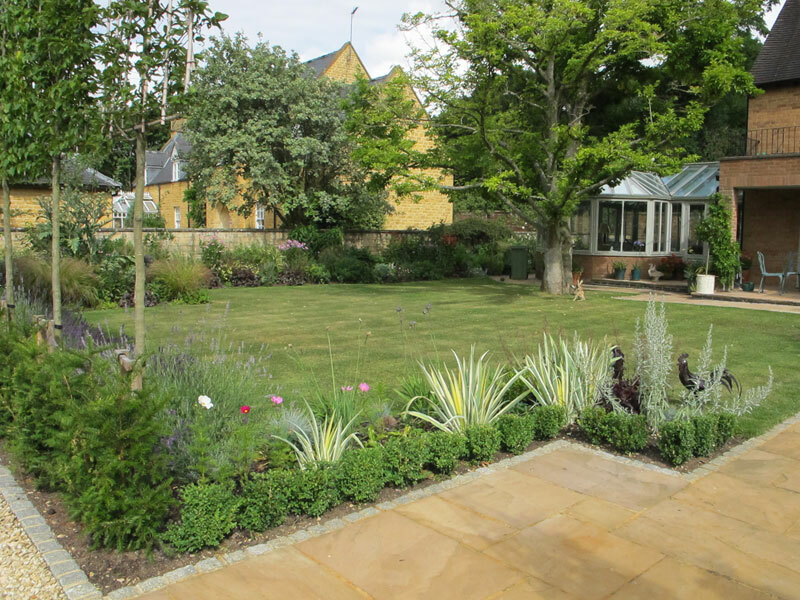 Sandstone paths, edged with granite setts led to a large lawn area with long herbaceous borders and a shrub border. 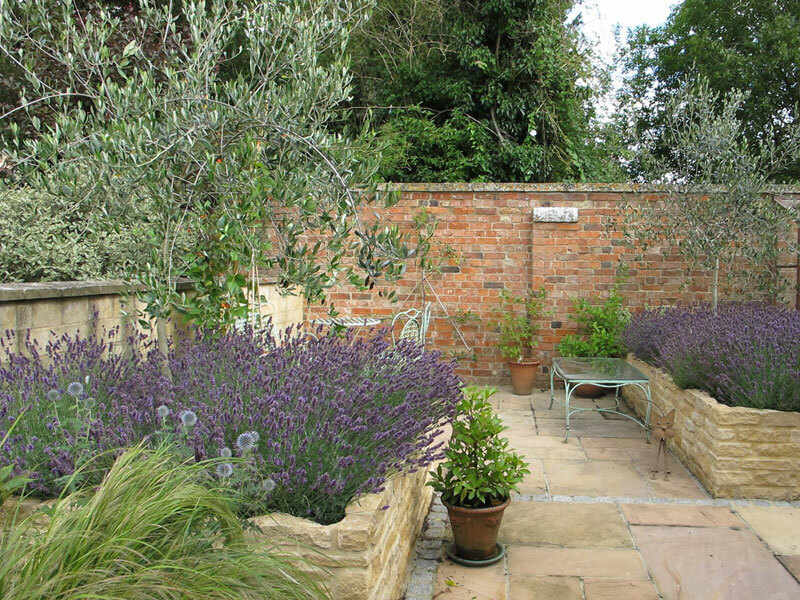 A seating area was created at the front and the back of the house, along with a vegetable garden. 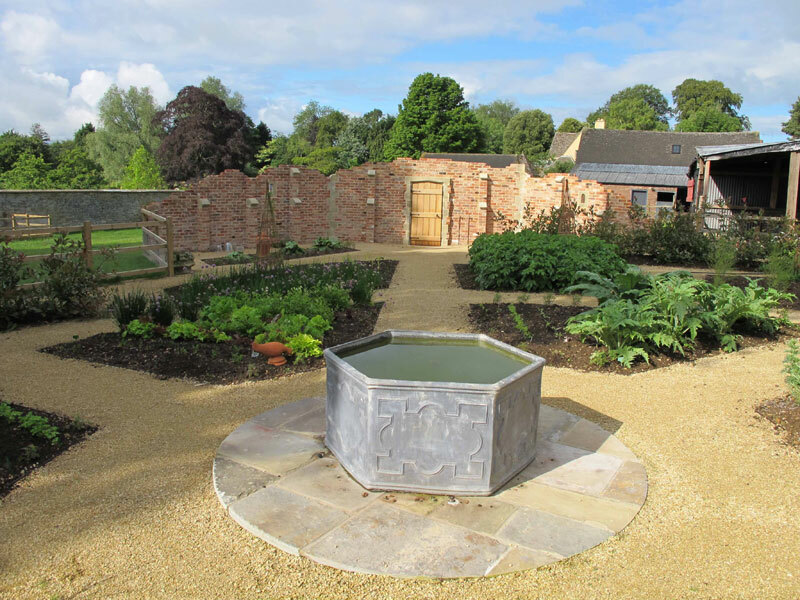 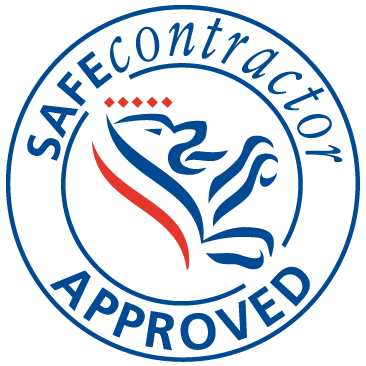 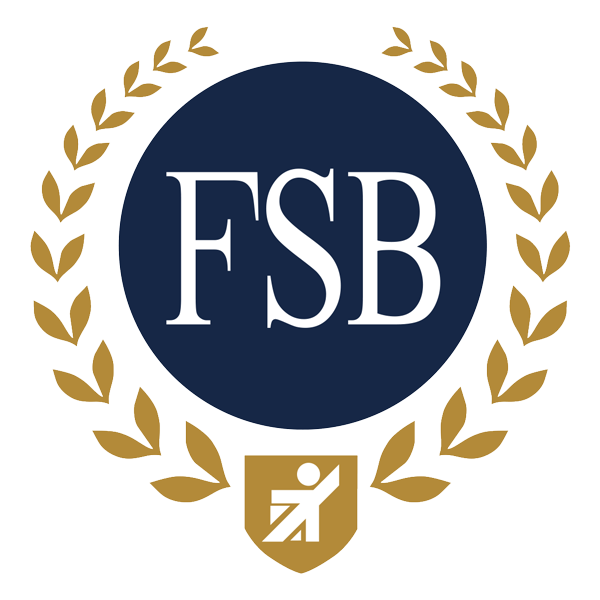 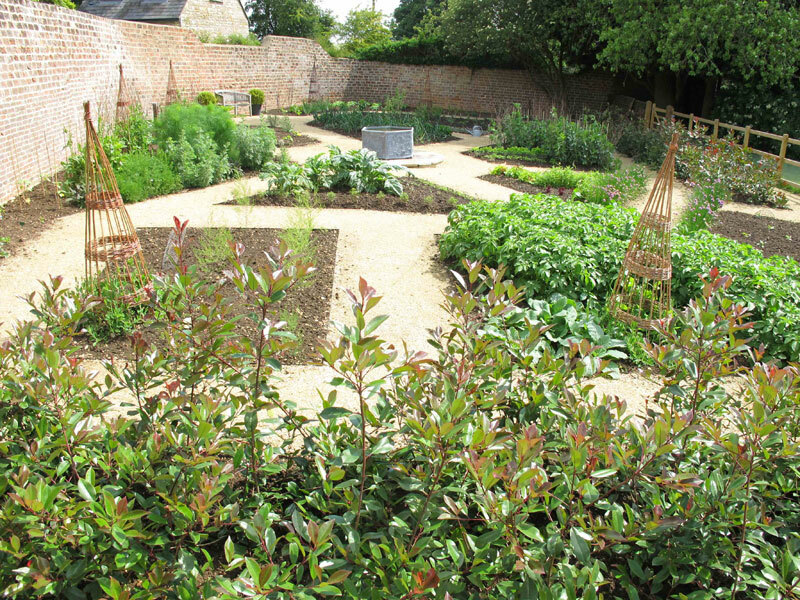 Brief – To work with the client to create a kitchen garden that looks like it has existed for a considerable number of years. 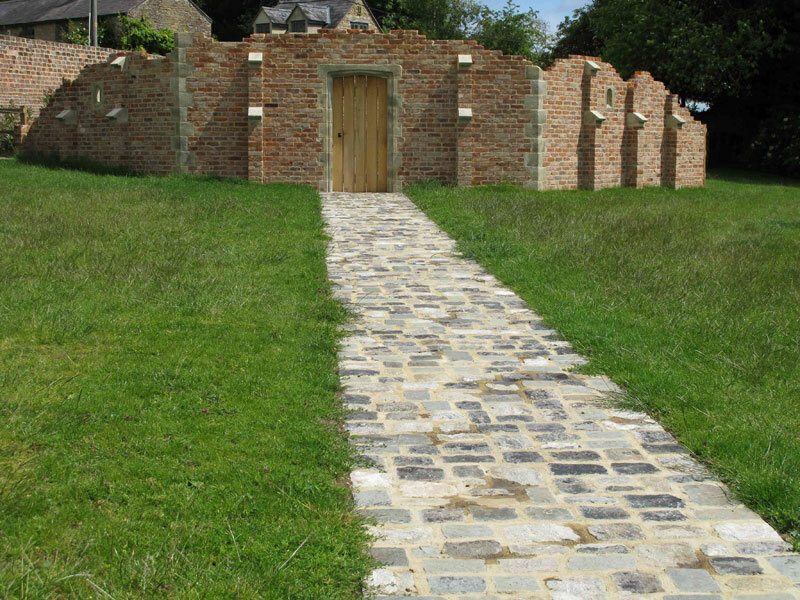 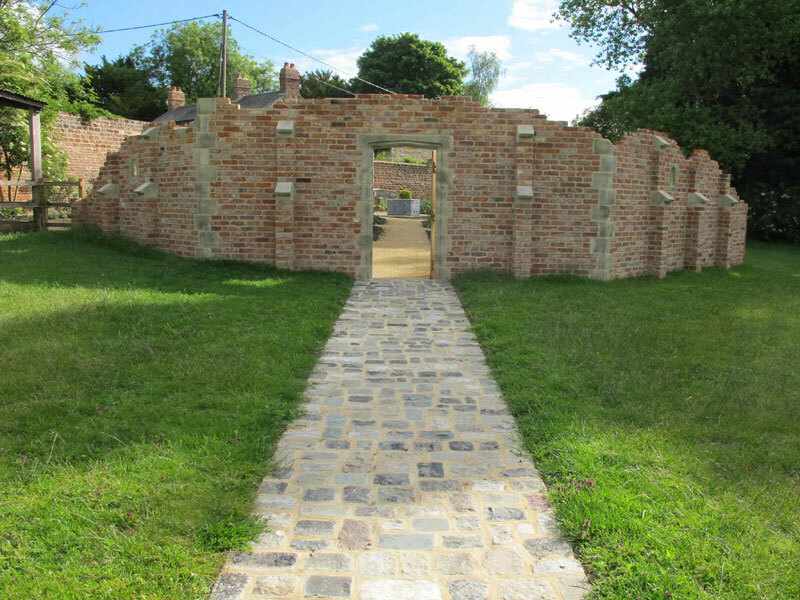 A path of reclaimed granite setts was laid in a random pattern leading up to the Folly which provides a dramatic entrance to the garden. 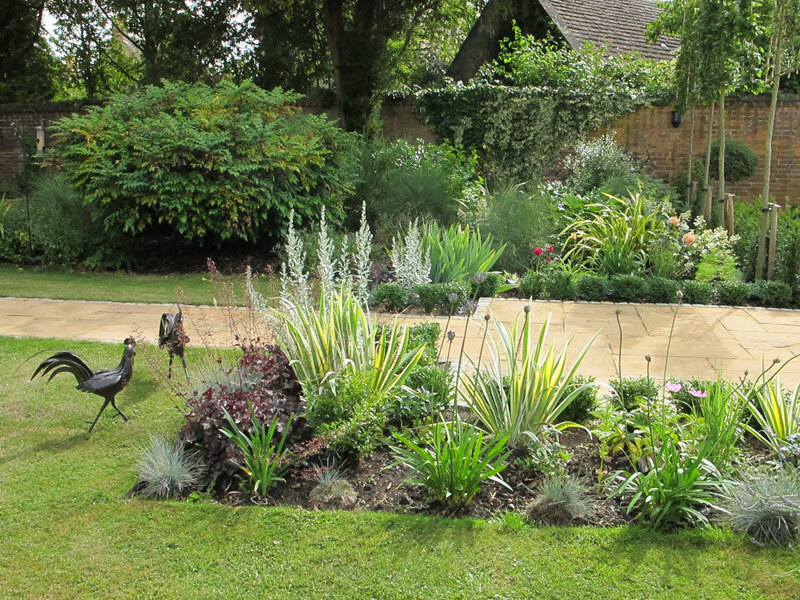 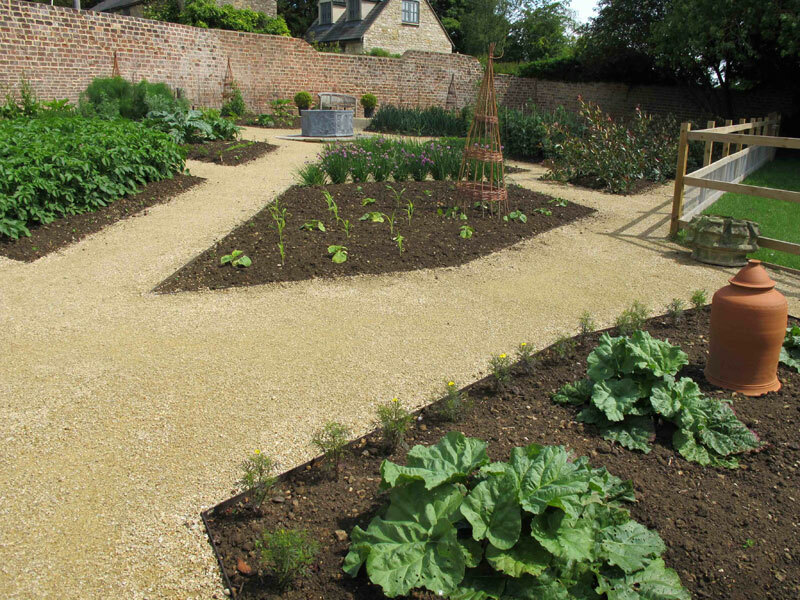 Within the garden are a number of geometric vegetable beds radiating from a central water feature, with hoggin paths and Photina ‘Red Robin’ hedges. 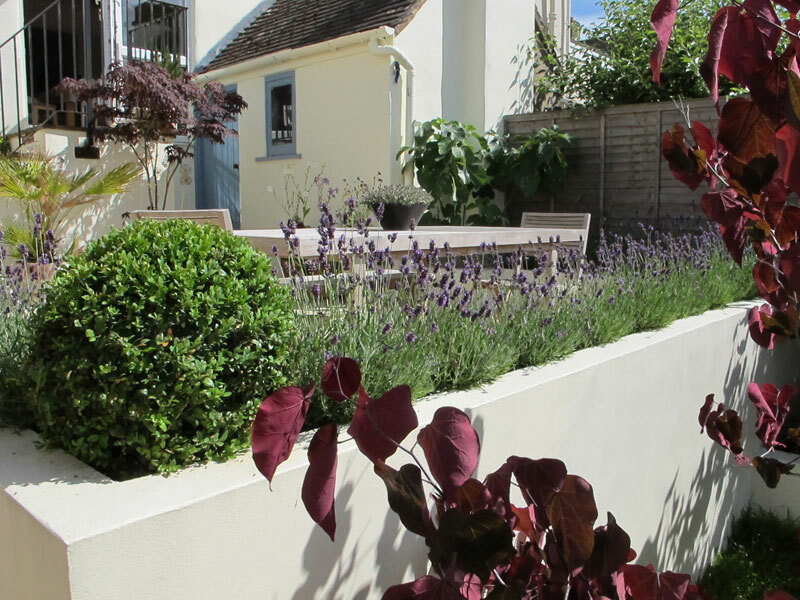 Brief – The client wanted a garden where they could indulge their passion for plants, and also have a space where they could relax and entertain. 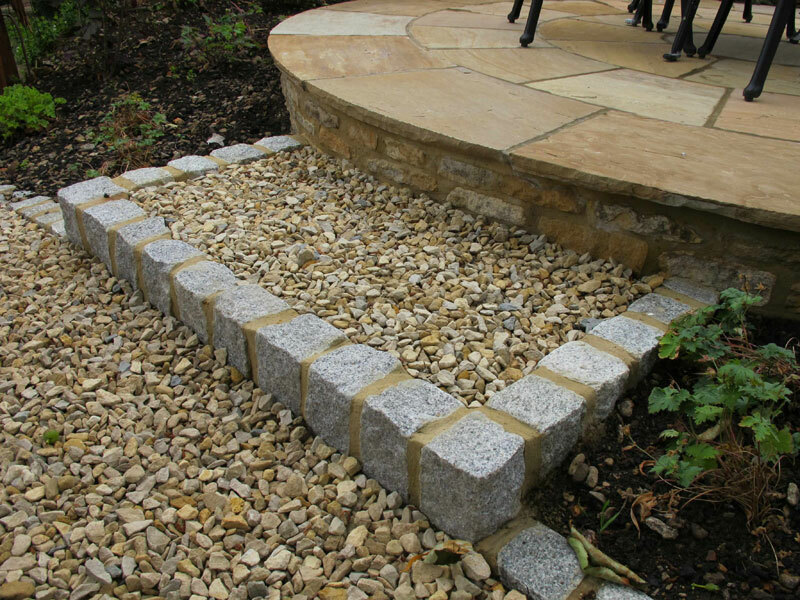 They also needed a simple access to a path at the back of the garden. 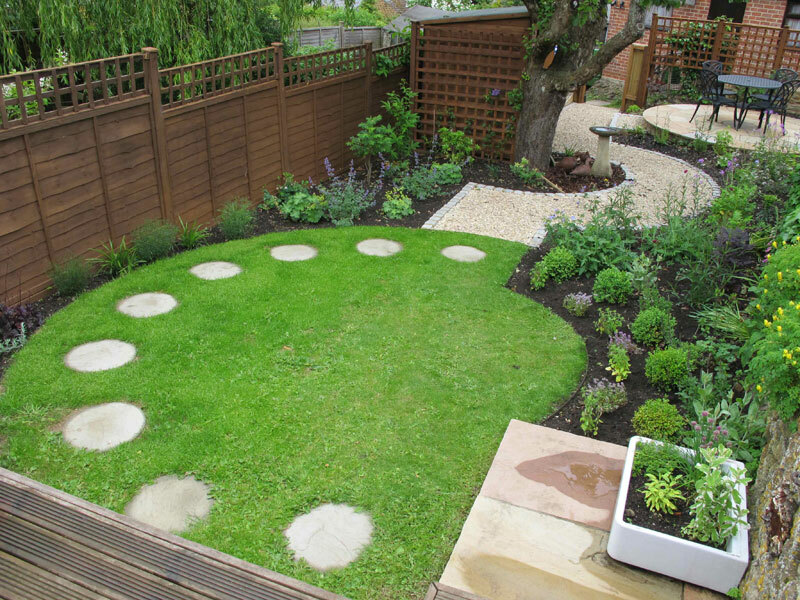 The design used interlocking circles to lead from the existing deck through the lawn and around a beautiful old Apple tree. 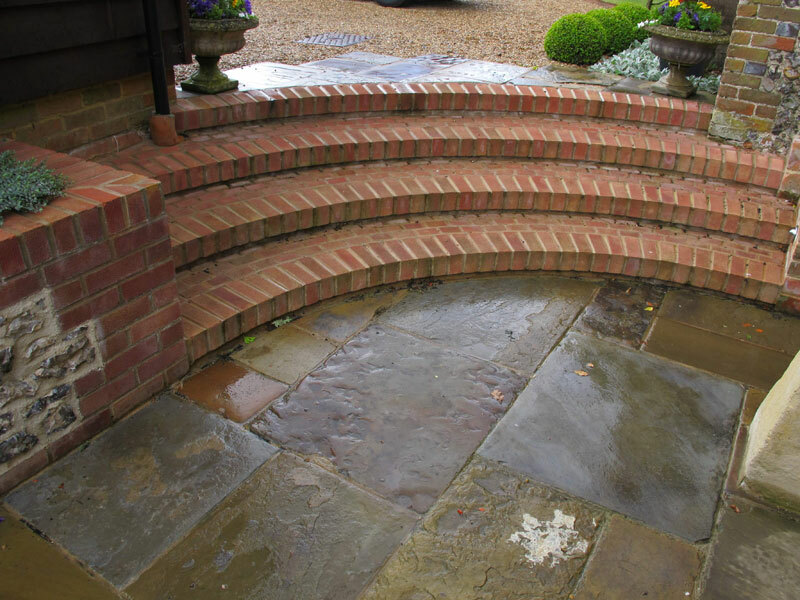 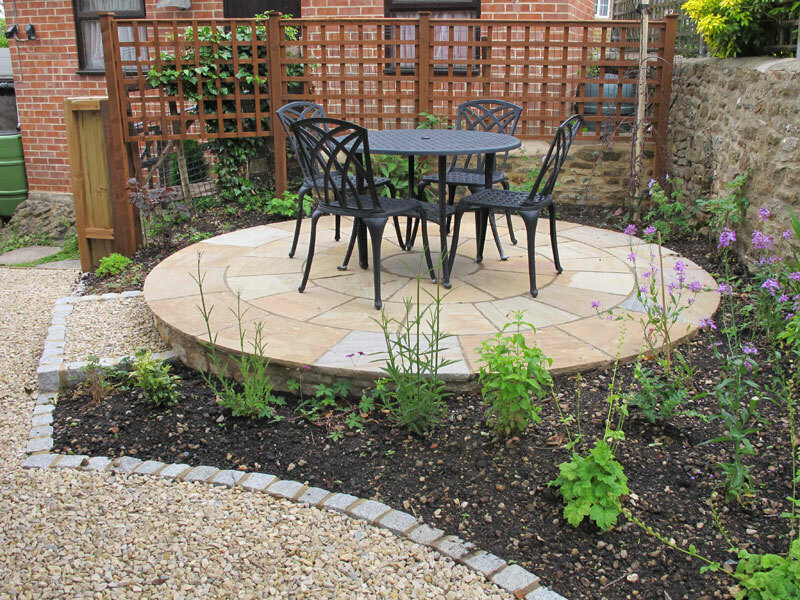 A step up to a circular paved seating area added a change in level and view of the garden. 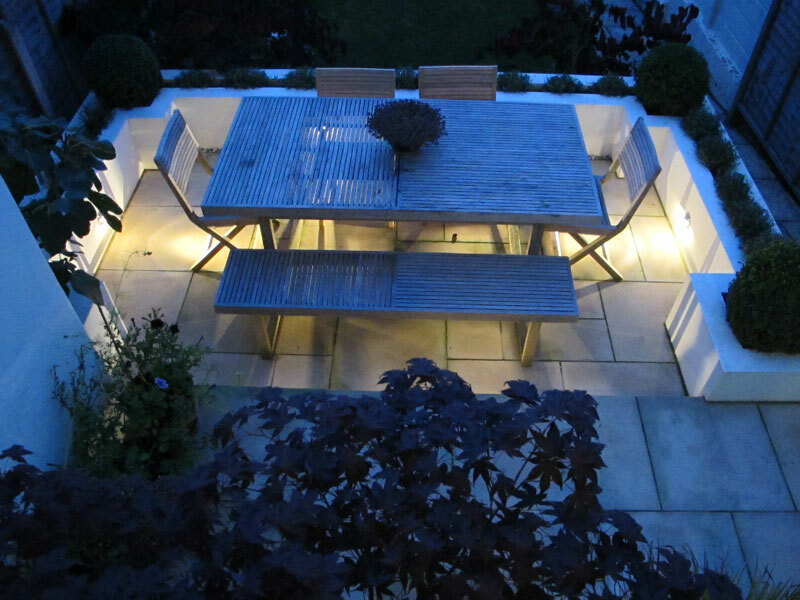 Brief – This garden required a modern and contemporary seating area for this client to be able to entertain family and friends, but also had to cope with a steep sloping garden. 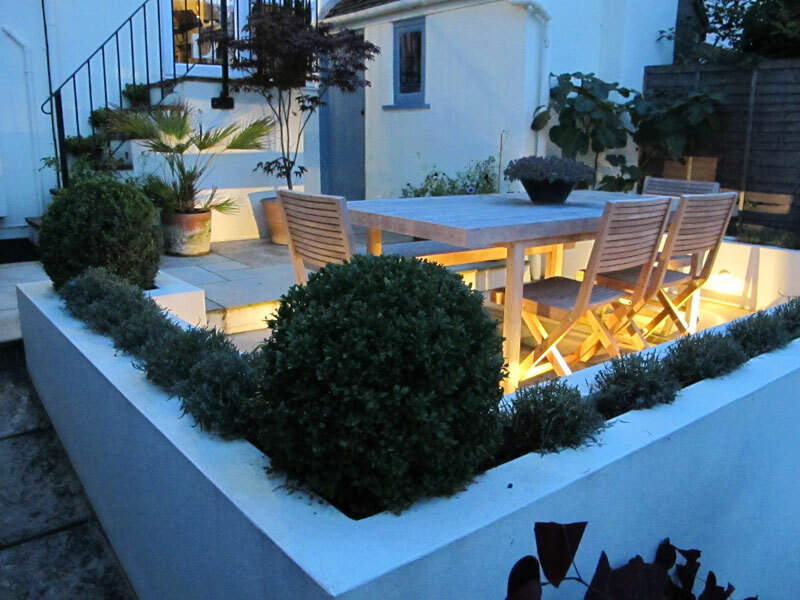 The solution was to build a modern terrace with polished sandstone paving, and the clean lines of a rendered raised planter around the outside of the terrace. 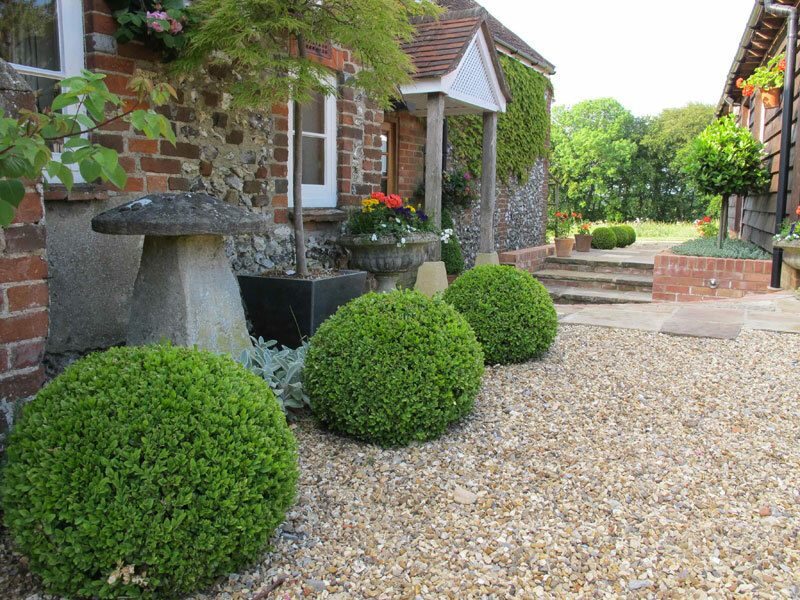 Lavender and clipped topiary Box balls provides soft evergreen planting which contrasts with the contemporary lines of the terrace. 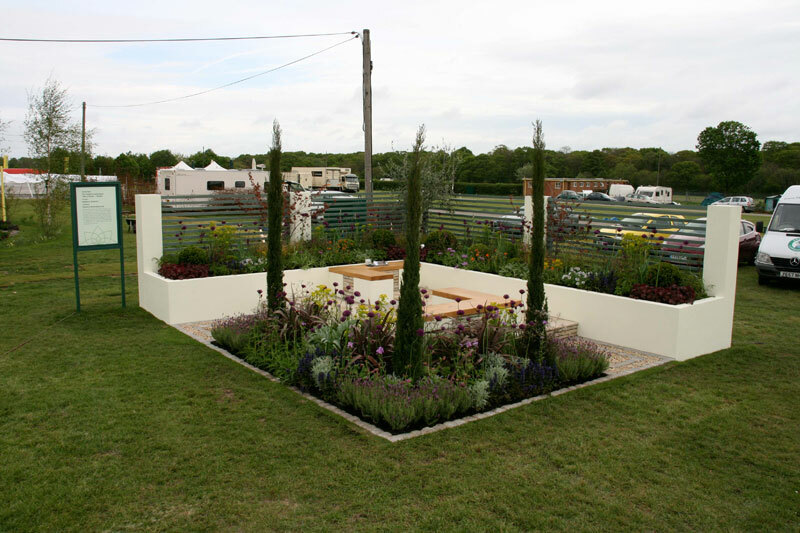 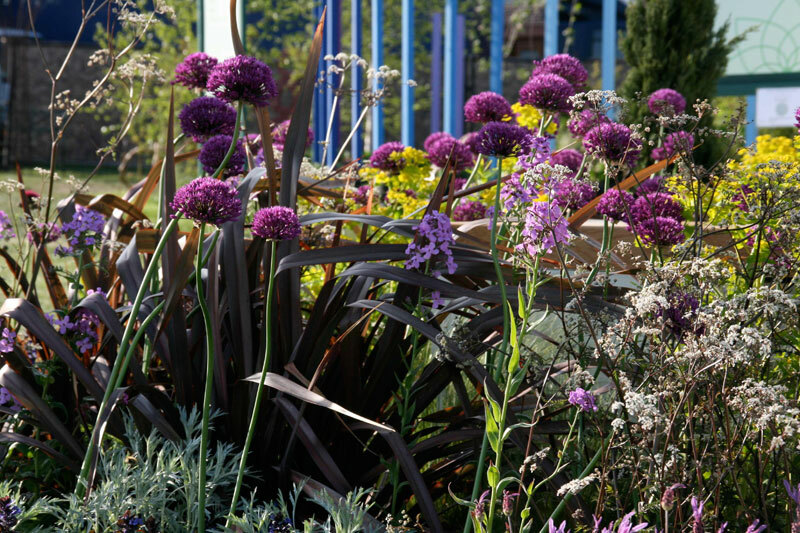 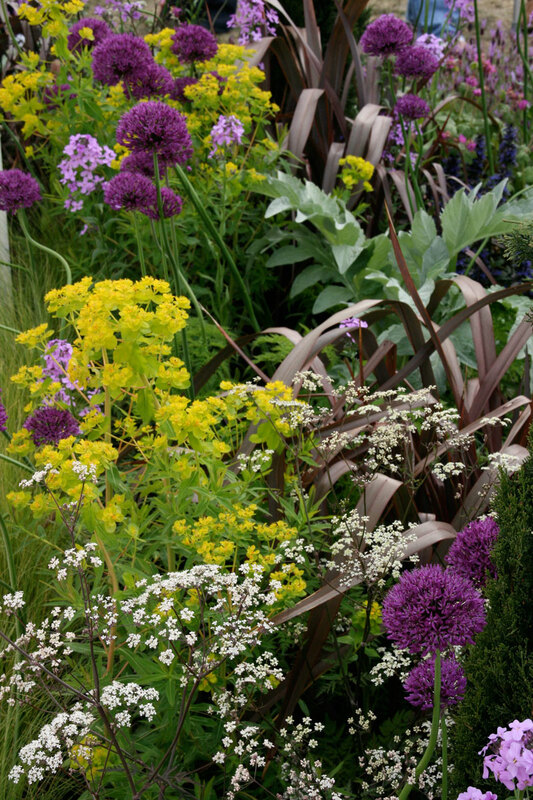 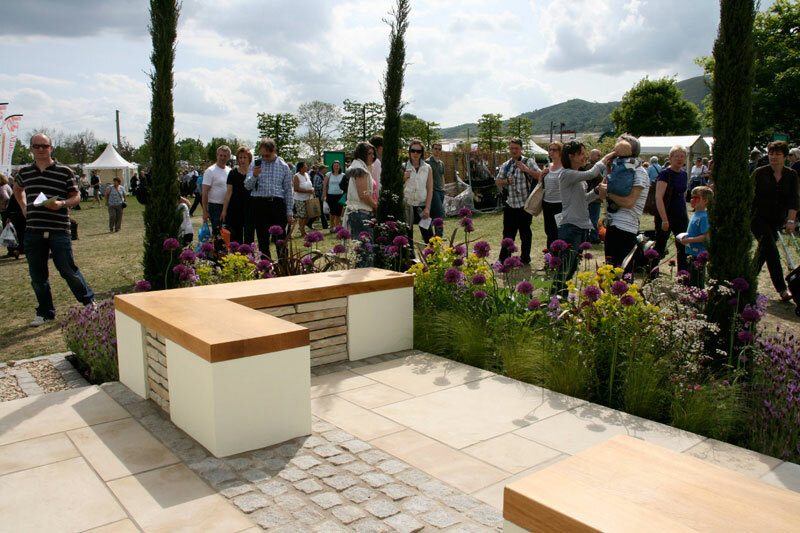 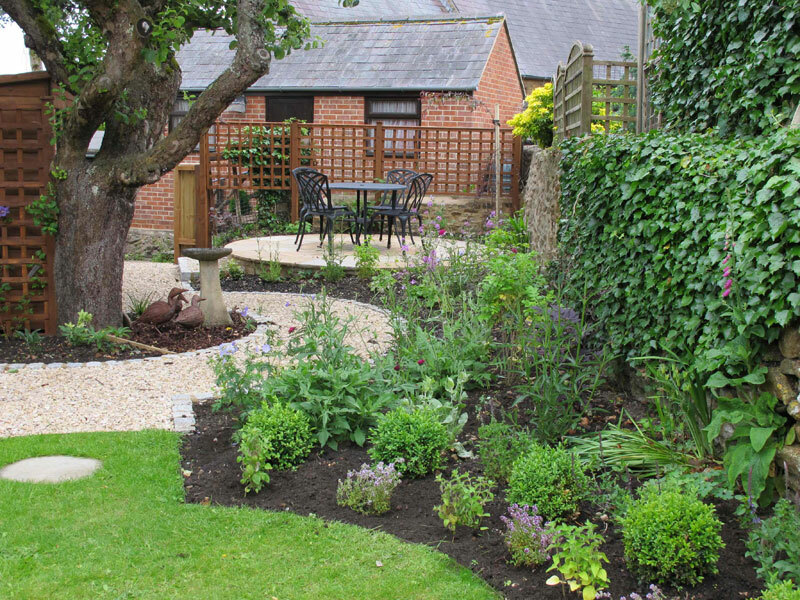 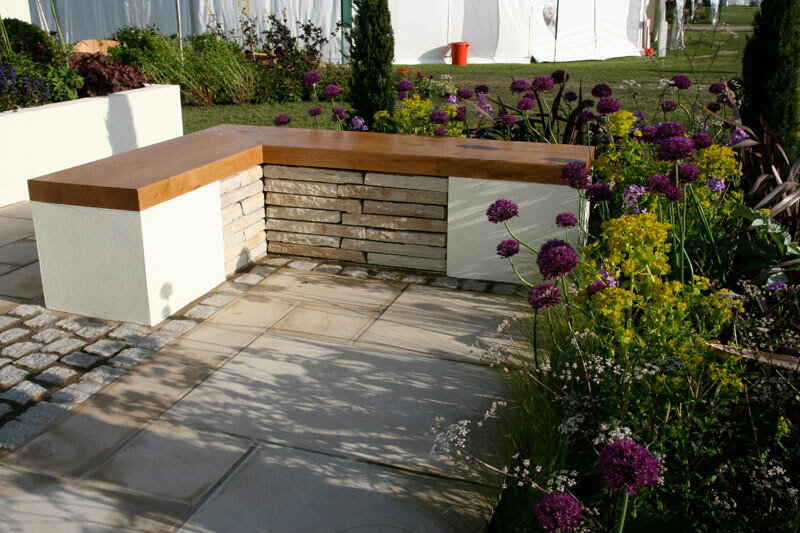 Brief – This garden was designed for a show garden at the Malvern Spring Show. 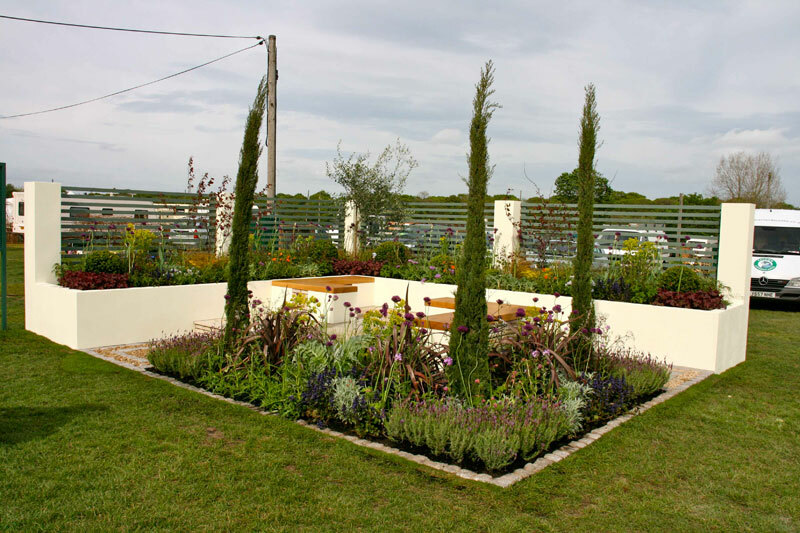 Its purpose was to provide a small office with an attractive, relaxing space for their staff to have a break from their working day. 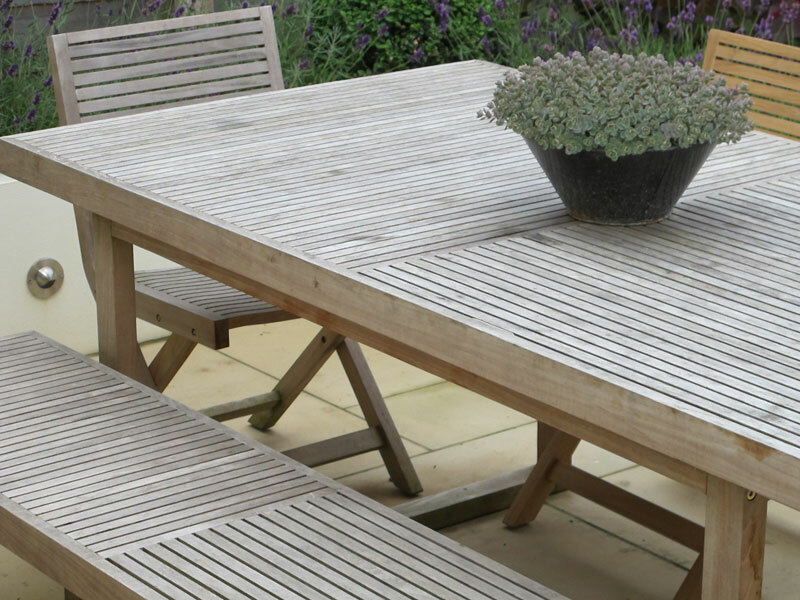 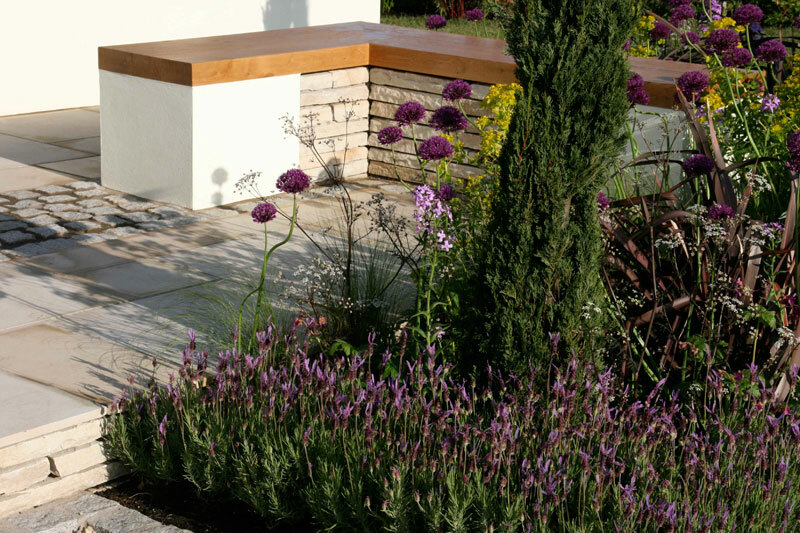 Smooth lines were created with rendered raised planters and bespoke oak benches provided the perfect place to sit. 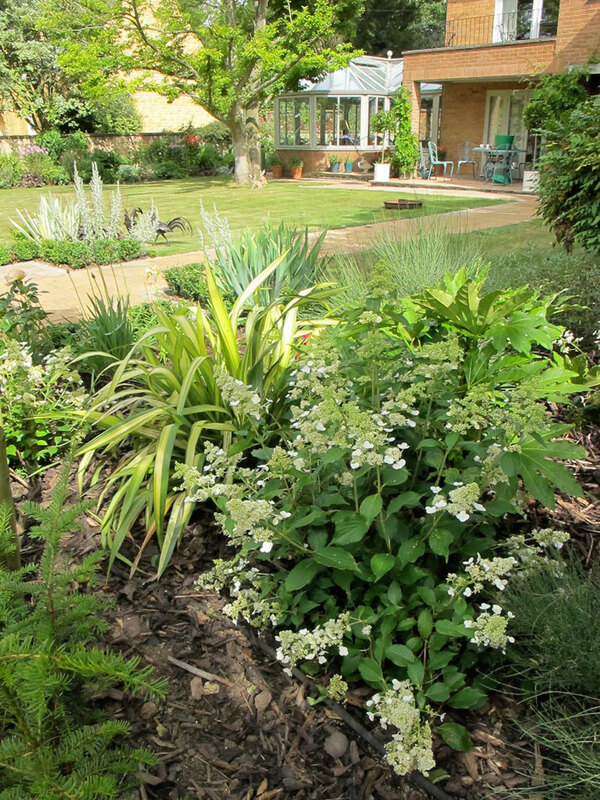 Year round interest was guaranteed with strong evergreen planting, which is softened by perennials to provide real impact from April to November.